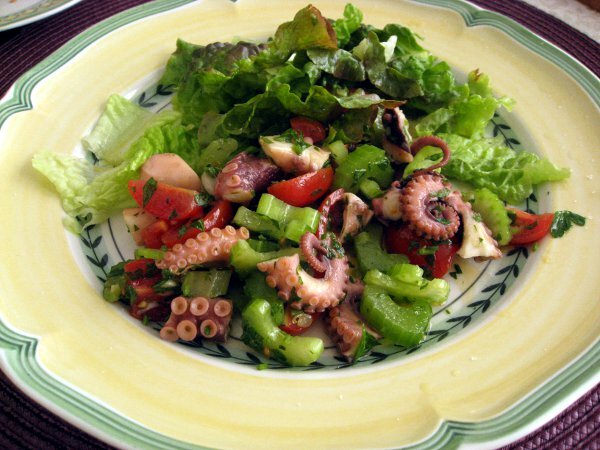 Octopus salad is a great summer dish. This is my quick version, instead of boiling the octopus I buy the marinated octopus sold in the delis (Fareway and Grace’s in New York have it, and also any Greek grocery store should have it). I then freshen up the octopus with chopped fresh vegetables and some dressing. Chop the octopus in smaller pieces, cut the grape tomatoes in half , chop the celery, scallion and parsley. Mix all the ingredients and dress with some good extra virgin olive oil, hot chili pepper, lemon juice, and salt (not too much salt, only enough for the vegetables because the octopus is already salted). If you like you could add a bit of crushed garlic, and/or some red or yellow bell pepper chopped in small pieces.